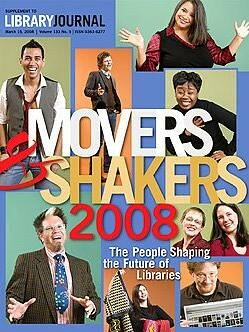 Ever since Library Journal began publishing an annual list of Movers and Shakers, it’s been a joy learning about the rock stars of the library world. Most of them have made huge contributions to the profession and — perhaps more significantly — influenced how the general public perceives libraries. All of them are achievers. This year’s honorees have just been announced and they include David Lee King and Tim Spalding* — two people I’ve come to admire over the last year or more. ** Congratulations David, Tim, and the rest of this year’s class. Considering that past winners include Helene Blowers, Meredith Farkas, Michael Stephens, Jessamyn West, etc., you’re in excellent company. BTW: I’ve looked over the list but haven’t finished reading all the stories yet. The Library Journal site has the authoritative list, of course, but Jessamyn West’s annotated list is much easier to use: It includes real names! * That’s Tim in the bottom right corner of the cover. ** On a personal note, I’ve been proud to know several of the movers and shakers from previous lists. They have each showed me nothing but friendliness, cooperation and service — just as they exemplified resourcefulness and innovation in their work. It’s no wonder they succeed. There are several ways people learn, but few are both as effective AND reviled as role playing. Sure, you might find one or two people in any classroom willing to act out some improv in front of a group, but volunteers are usually hard to come by. That’s unfortunate because experiencing a scene first-hand lets the learner feel it inside. Her motor skills function and her brain processes subtle aspects of a concept she wouldn’t pick up reading or a listening to a lecture. Even an audience watching a role play learns more because it can identify with the colleagues on stage. I was thinking about this Friday when I attended a crisis prevention class at the Renton Public Library (WA). The class, which I’ve taught many times myself, was this day led by Mary Ross and Kate Laughlin. Their interactive exercises fostered a lot of participation and follow-up discussion. In my experience as a library trainer, there are a few strategies that tend to get good role play results whatever the topic might be. 1. Don’t call it a role play! Call it practice (as Ross and Laughlin did) or exercise or interaction, but mention the “role play” term and your students will immediately drop beneath their tables hoping you won’t see them. Fearing that you’ll recruit them, some might become too anxious to learn the lesson. 2. Involve everyone …or as many people as you can. It’s easier to engage everyone in a practice activity if they aren’t the only ones on stage. Have many stages at once, in fact. Break the class into small groups so everyone can participate in relaxed settings with fewer eyes watching them. It reduces the embarrassment factor. 3. Offer a realistic scenario. If you want a group to work through a scene, give them a setting and a situation that they can relate to. They will take more from the lesson and be more cooperative in the exercise if they see it in the context of their experience. That means they’ll connect with the material more deeply. 4. Make it fun. You’re giving them a realistic scenario. Great! Now be a stage director and tell them something juicy to give them motivation. Maybe you want them to show a certain emotion, imitate someone, or get a little melodramatic. A scene is just a scene, but an emotional hint breathes life into it. Most people, once they get into it, actually enjoy exploring a different character for a couple minutes. Sometimes practice can be packaged in the form of a game, too. 5. Keep it simple and short. Set up the scene in a few sentences. Target the lesson being taught and avoid complications. The actors will discover their own nuances and complications. End it before the fun wears off. Hopefully the lesson already started to sink it. It’s usually good to follow up an exercise with a quick discussion, too. Each actor experienced the scene from a different perspective. Let them share what they saw from those angles. I spent Friday in class at the Renton Public Library (WA). 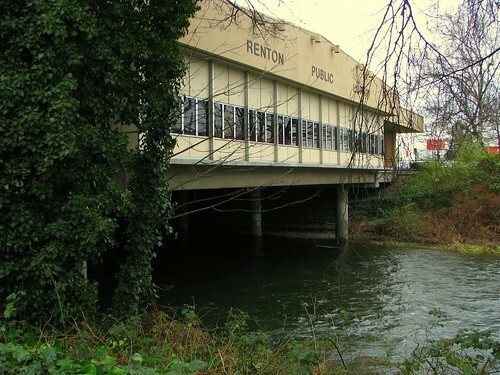 It’s a unique place — the only library I know built completely over a river. Windows span the upstream and downstream widths and the main entrance is mid-river on the east side. The all-day visit was enjoyable and the staff at Renton were terrific hosts. 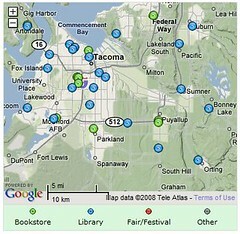 You are currently browsing the LibraryStream blog archives for March, 2008.